we love nothing more than to do a before & after on your roof. The team at Full Circle, both really enjoy, and specialise in home roof cleaning. We utilize great equipment that makes the task ergonomic and our customers are always really happy with conspicuous value for money (with often unbelievable results possible). Important steps in setting-up our equipment have been made, in order for the cleaning process to have as little wear and tear as is possible and give the absolute best result. 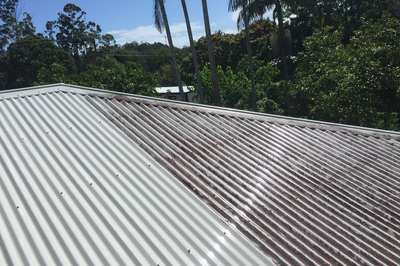 Corrugated iron roof cleaning and tin roof cleaning often clean-up the best; but, tiled roof cleaning is also very rewarding, particularly if you have a moss covered roof. For clients whom are concerned about the age of the sealant or paint of the roof, before and during cleaning, we’re able to advise you if the cleaning will require a roof paint in the future and are able to offer you a very competitive quote for quality roof paint on the same day. 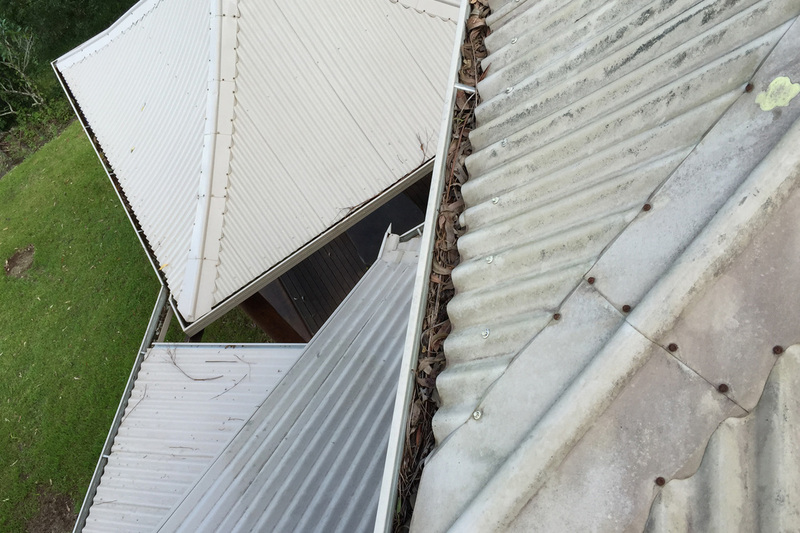 Commercial roof cleaning in Byron Bay, or Lismore for example, is something that many businesses consider periodically. 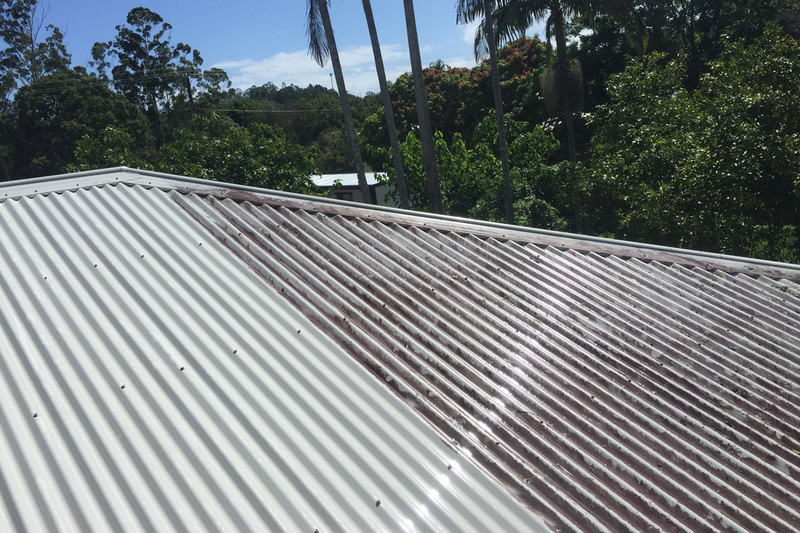 Due to the proximity of much of the Northern Rivers population to either salty air near beaches or dusty air nearer to farmlands, there is good reason to get a large commercial roof cleaned. Roof manufacturers, painters and even roof paint companies recommend frequent pressure cleaning of roofs and other surfaces. By gently pressure cleaning a roof with mould spores or a constant dust layer, it enables the paint to breath and can prolong the life of a structure. Obviously on a large scale this can mean roof cleaning a commercial building can be a very wise preventative maintenance measure. 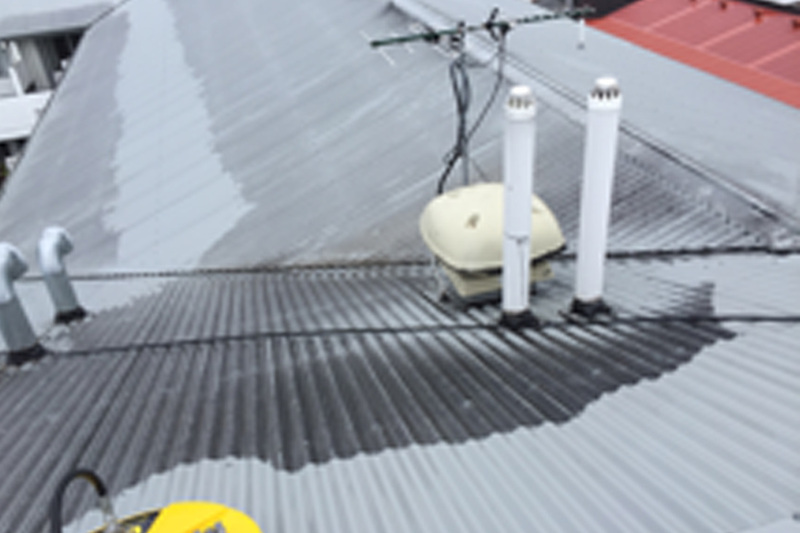 At Full Circle with the largest whirl-away units and pressure pumps on the market, we can offer economy of scale to any business looking for a roof cleaning quote. How do you clean a roof? There are several techniques to clean a roof, or complete roof mould removal. At Full Circle, each team member is firstly anchored to the roof using ropes and a full arrest harness – meaning that if they were to slip, the rope and harness is capable of catching their body weight. 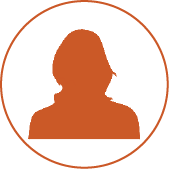 Our safety methods have been discussed and approved by local Workplace Safety officals. Then, either a pressure wand or whirl-away machine (much like a pressure cleaning lawnmower) is attached to the high pressure hose dragged-up onto the roof. Depending on the pitch and grip the roof offers, we’re able to select which piece of equipment we utilize that best cleans the dirt or mould from the roof. All roof cleans are quoted with a gutter flush (although, for badly clogged gutters a extra small charge is made known to you for spooning-out the mud or foliage from inside the gutters). 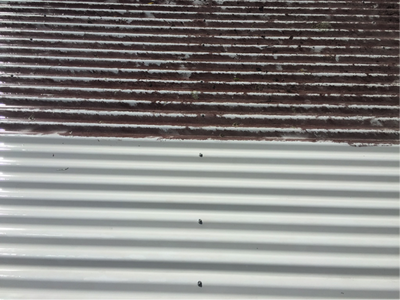 And finally, standard practice after the roof and gutters have been cleaned, is to thoroughly rinse the walls, paths, windows and general area from the dirt or mould cleaned off the roof. 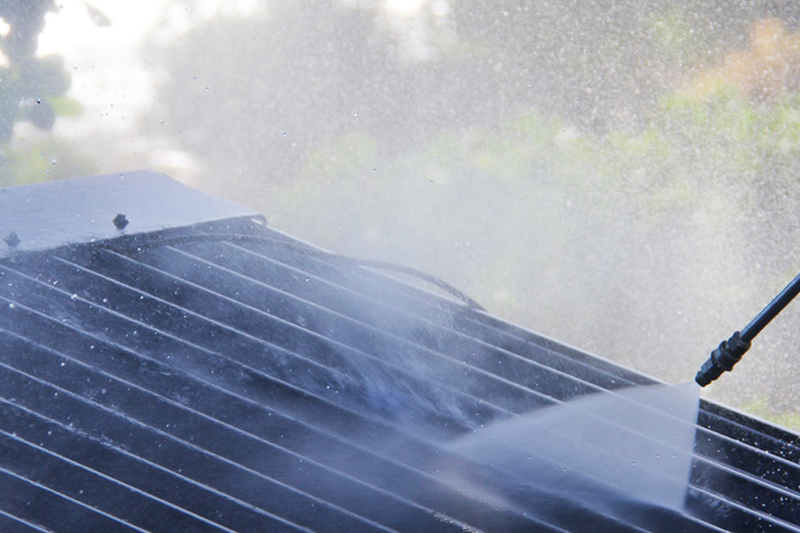 Roof cleaning quotes are straight forward, whether it’s a home or business. 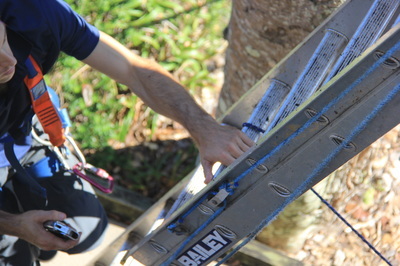 Like all of our work at Full Circle Refinishing, roof cleaning quotes are fix priced upon a formal inspection and measurement by our owner manager Oliver Hallock. It’s important that all home owners are made aware of the health of their roof, before a pressure cleaner starts work on it. 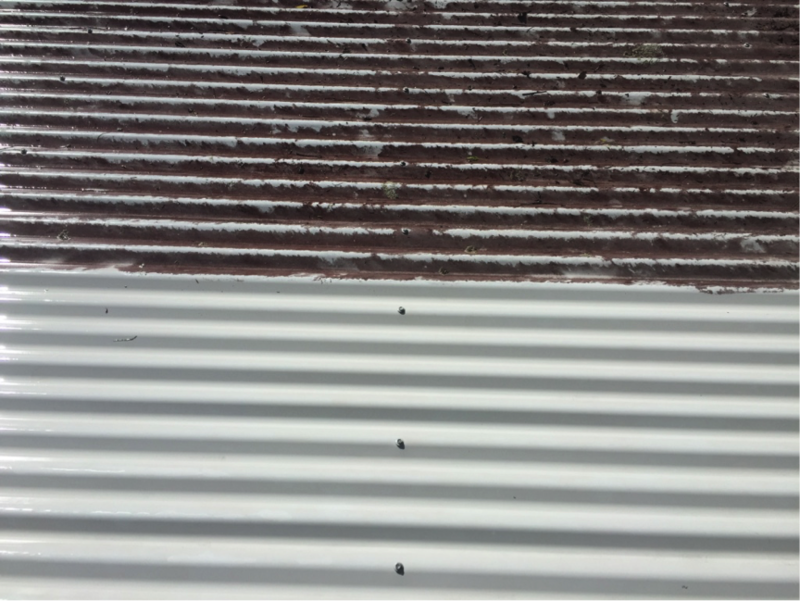 In some instances due to age or state of the roof, it may require re-sealing and painting after it has been pressure cleaned as the nature of the pressure required to clean a roof can also effect the seal. We will always make you aware of this where this is the case and offer a competitive quote on roof painting if requested. To quote a roof cleaning job we utilise a laser measurer to give us an accurate square meter total of the roof. This is then multiplied by the corresponding rate. Anywhere from $2-3/m2 (before GST) is possible, with the bulk of roof cleaning quotes somewhere in the lower to middle range. The rate is adjusted according to set-up factors, severity of clean required, pitch of the roof and other aspects. 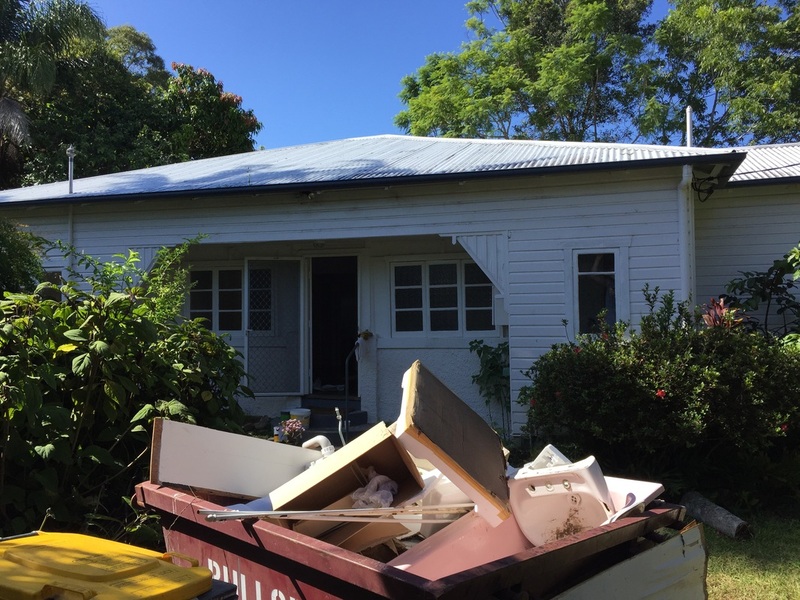 Lucille required a full pressure clean from top to bottom whilst renovating an investment property in Mullumbimby. We started with the severely mouldy roof, which not only added instant value to her bottom line, it saved many thousands of dollars worth of paint deterioration down the track.